On PC, Xbox 360 and PlayStation 3, Activision’s Call of Duty 4: Modern Warfare was one of the most popular and more critically acclaimed first-person shooters (FPS) of 2007. However, there was also a version of the game developed by n-Space for the Nintendo DS, and while it might not be as deep or flashy as its console counterparts, the handheld version of Modern Warfare succeeds at capturing the feel of combat while offering a nice FPS alternative to Metroid Prime Hunters. This is easily one of the best looking DS games released to date. The characters and environments are easily original PlayStation quality, and it is easy to find cover, locate enemies and take stock of your surroundings. The action takes place on the top screen, while the bottom one serves as both a map and your inventory screen. The developers definitely deserve some kudos for their work on the games graphics, and they deserve even more for the incredible sound quality. The gunfire and explosions are impressive, but not as impressive as the sheer amount and quality of voice work included in Call of Duty 4 DS. Whether it’s a faux news report, a commanding officer barking orders at you, or an enemy soldier alerting his comrades to your location, the acting is so good it’s simply astonishing. Most fans seem to be mixed on the controls in this game, but personally, I think they work quite well. The directional pad is used to move, with up being forward, down moving you backwards and left and right allowing you to slide from side to side. Tapping up twice causes your soldier to spring, while tapping down twice allows you to crouch and seek cover. Sliding the stylus around the touch screen causes you to look around or aim, while touching a weapon causes you to switch to that firearm and double-tapping the touch screen causes Aim Down Sight or ADS mode to activate (which allows you to use your scope for improved aiming. The touch screen is also used in other ways, such as for controlling the minigames required for setting or disarming explosives or activating binoculars that allow you to call in airstrikes. Weapons are fired and grenades are thrown using either one of the shoulder buttons, depending upon which is more comfortable for the individual games. Pretty solid stuff on the whole, but the ADS mode has the annoying tendency to activate when you don’t want it to. Call of Duty 4: Modern Warfare is a pretty standard military FPS game, and thanks to the solid controls, it does play remarkably well. There are some irritations, however, such as the aforementioned issues with the ADS aiming, as well as some problems locating enemies who are firing at you, particularly while moving at high speeds in a vehicle. Enemy A.I. is also questionable, as they have a tendency to hold their ground and not pursue you, regardless of circumstances. There is a 12-level single-player campaign mode which has three difficulty levels and should take most gamers anywhere from four to six hours, give or take. On top of that, there are both single and multi-card multiplayer modes, with the latter offering FPS staples like death-match and capture the flag. It lacks the depth of Metroid Prime Hunters and as a result, probably won’t hold most gamers interest for quite as long as the Nintendo offering. 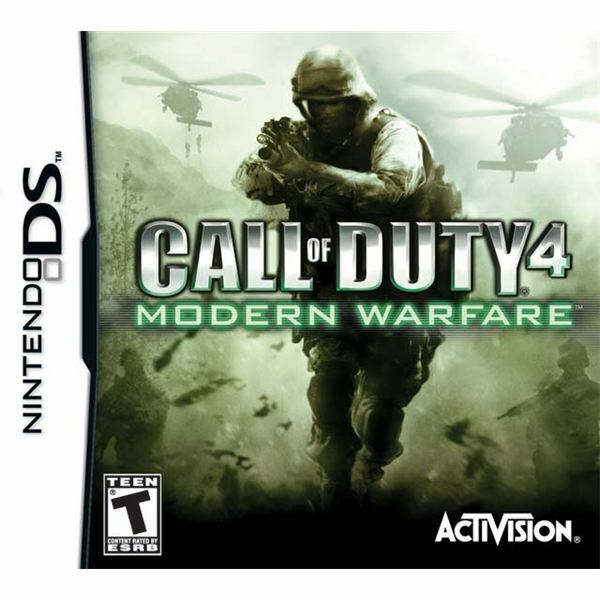 Call of Duty 4 isn’t the best first-person shooter available on the Nintendo DS, but it is the grittiest and the most realistic, and it will appeal to fans of the genre. The controls are solid and the audio and video presentation are exceptional. If you’re a fan of the genre, you should definitely check this game out. If you’re looking for an alternative to Metroid Prime Hunters or are simply in the market for a new FPS, you won’t regret picking up Modern Warfare. However, if you’re the type who only feels the need to own one FPS title, this isn’t the right one. Go with Hunters instead. While it is an enjoyable and engrossing experience, the fact that it lacks multiplayer depth certainly hurts it in the long run. Read various reviews and previews of Call of Duty 4: Modern Warfare in this article series.